Lawsuit filed by CEO of Daley Technology Systems contains explosive claims. In 2007, the U.S. Attorney’s office in Brooklyn announced it was ceasing prosecution of Tribune publications Newsday and Hoy for padding circulation figures, in exchange for the papers agreeing to pay a $15 million fine and $83 million in restitution. 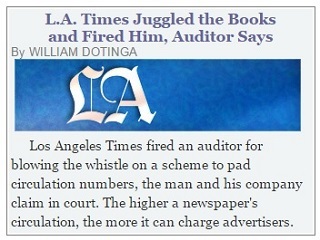 Now comes a lawsuit on the west coast alleging similar goings on, at that time, at another Tribune Publishing property, the Los Angeles Times. At some point, [plaintiff Tom] Daley says he became aware of “past fraudulent behavior at the Times, whereby the Times entered into agreements to ‘buy its own newspapers’ and count the purchases as part of its circulation,” the complaint states. No high-level executives are parties to the complaint. As a result of his findings, Daley, who was first contracted with the paper in 2007, says a meeting was arranged with outside counsel and a representative from the paper in February 2013. He claims that within a few months, during which time he continued to provide the paper with evidence of illicit activity, his $6.4 million contract with the publication was canceled, in breach. It’s unclear from the summary of the February 25 Superior Court filing what time period the alleged circulation padding covers, or whether the law enforcement authorities Daley notified are actively involved. The Newsday and Hoy transgressions occurred between 2001 and 2004, leading nine executives to be sentenced to five years’ probation. Newsday was sold in 2008 to Cablevision, while Hoy remains in the Tribune fold. Daley meanwhile worked previously at the LA Times as a business development manager, from 1996 to 20005. The claims are utterly baseless. Missing from Daley’s own complaint is the fact that Daley is a former LA Times employee, who was terminated in 2005 and whose separation agreement prohibits him from doing any business with the company. Yet he still sought business from the Times with a lower-level employee who was unauthorized to enter into an agreement. When the Times learned of the alleged contract, it promptly canceled the arrangement, citing the provisions of the separation agreement. It’s also curious that Daley would start to hurtle accusations eight years afterward, and still want to do business with the Times. The Times vigorously denies any wrongdoing and will seek its own remedies in court against Daley.